"would pace the private office, delivering precise, detailed instructions on a matter of considerable importance, only to discover that the Royal Navy's senior admiral of the fleet was, and for a time had been, dead to the world." ww2dbaseNevertheless, Pound was a loyal subordinate to Churchill, and had a good working relationship with the future Prime Minister. Some lower rank officers, however, complained of his habit of micromanaging issues that should had been left for others to decide. 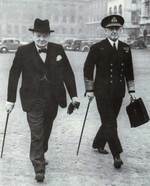 He resigned from the Royal Navy in Sep 1943 after his health really declined. He passed away a month later. 29 Aug 1877 Dudley Pound was born. 21 Oct 1943 Dudley Pound passed away from brain tumor at the Royal Masonic Hospital in London, England, United Kingdom.